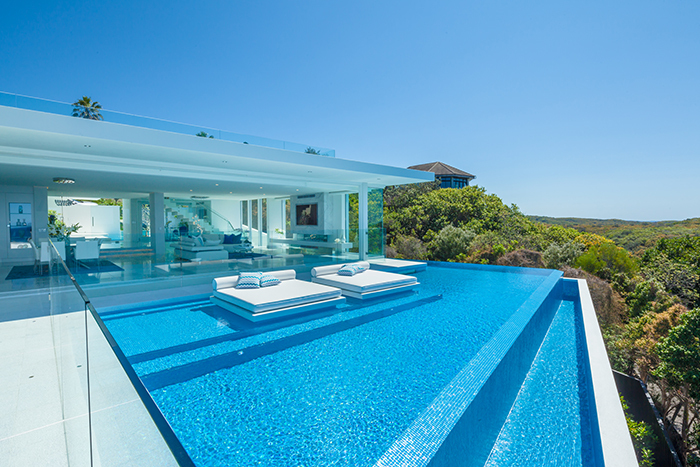 Towering three storeys above pristine Sunshine Beach on the Sunshine Coast, this breathtaking beach house is a vision of luxury and opulence. 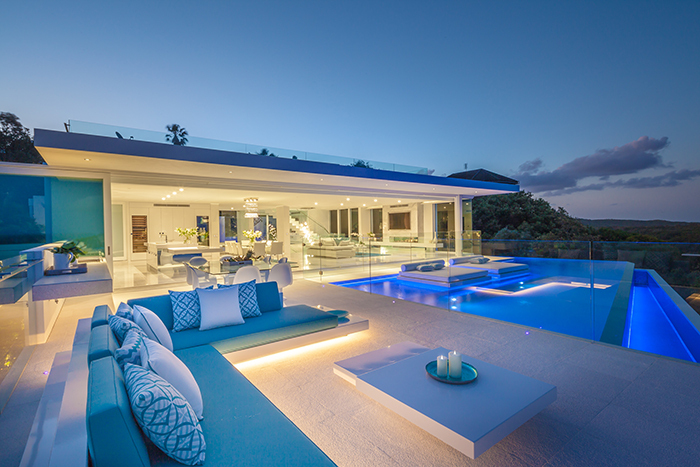 For Sunshine Coast building designer Chris Clout, the luxurious design of the Azure house wasn’t anything out of the ordinary, renowned as he is for his award-winning resort-style homes. It was, however, a project close to his heart. 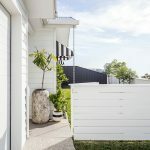 Approached by his uncle, builder Glen Watson, to design a high-end home for him and his wife Deb (an interior designer), the house was to also take advantage of the beautiful location overlooking the Pacific Ocean and be just as spectacular as its location, with its uninterrupted views out over the ocean and headland, as well as views down to Mount Coolum. 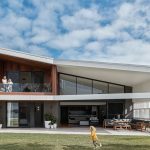 The sleek, contemporary home takes cues from the crisp façade of traditional Santorini homes, while still echoing Queensland’s coastal culture. 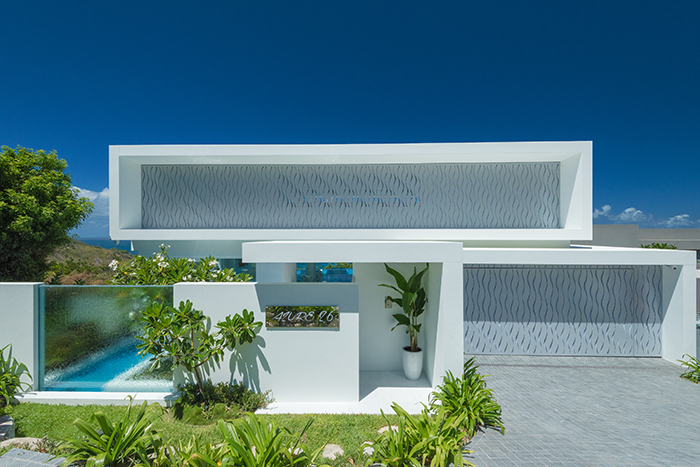 The motifs inside and out are one and the same – outside, glass panelling reveals a waterfall and frangipani planter, set against a clean white exterior, looking out towards a turquoise sea. 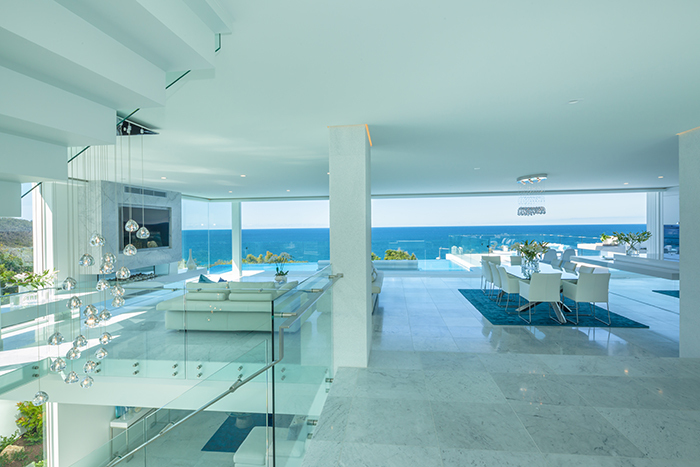 Inside, similar layers of white are set against cerulean accents scattered throughout the interiors; frameless glass doors take sunshine indoors, catching on glass detailing. 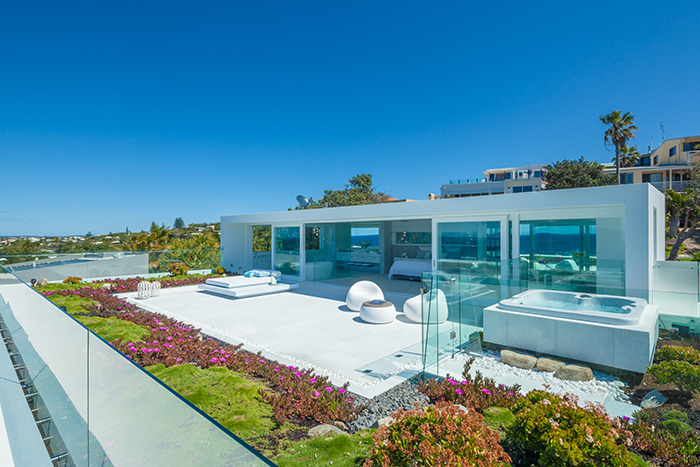 The luxury retreat has all the amenities one could ask for when dreaming of their own luxury beach home. Carrara marble is seemingly everywhere, decorating fireplaces and floors in an equal display of elegance. Three bedrooms occupy one floor; the fourth, as part of the decadent master suite, occupies the entire top floor (and, naturally, takes full advantage of the incredible views). 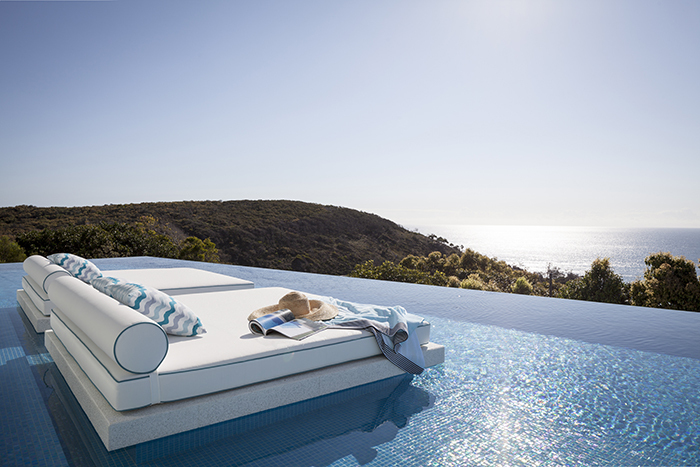 The super sized terrace also reveals the stunning infinity pool – a pool that is complete with its own twin floating daybeds, no less! And how right he is; from the moment you wander up the formed, zig-zag stairs, you’re met by an open plan layout housing everything from a spacious walk in robe to an open ensuite to, of course, the living quarters. 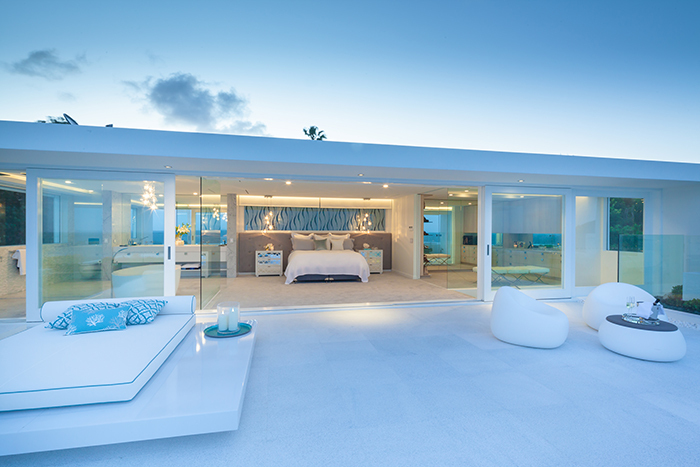 All is clad in immaculate white, with furnishings chosen to reflect the beauty of the outdoors. 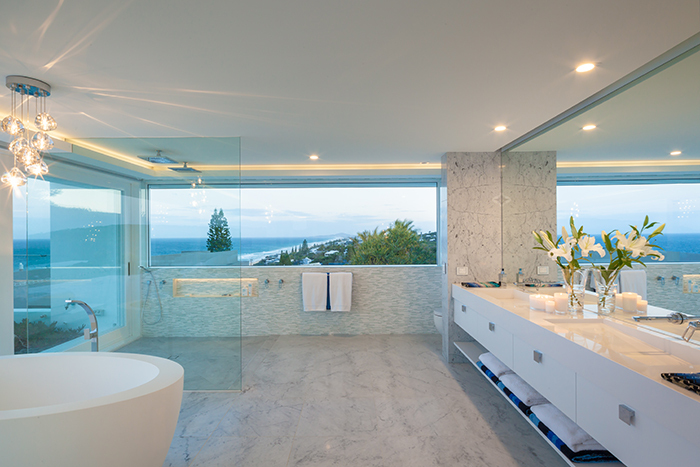 In the en suite, marble cladding and white 2pac sit below a full-size mirror, with a large shower finishing the space. It is all made complete with a large terrace outdoors, a daybed and outdoor spa giving no reason to really leave this private escape. 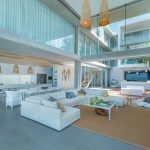 Wandering through this stunning coastal home, bathed in natural light, you could almost imagine looking out below onto the glossy waters of the Caldera rather than the Pacific. 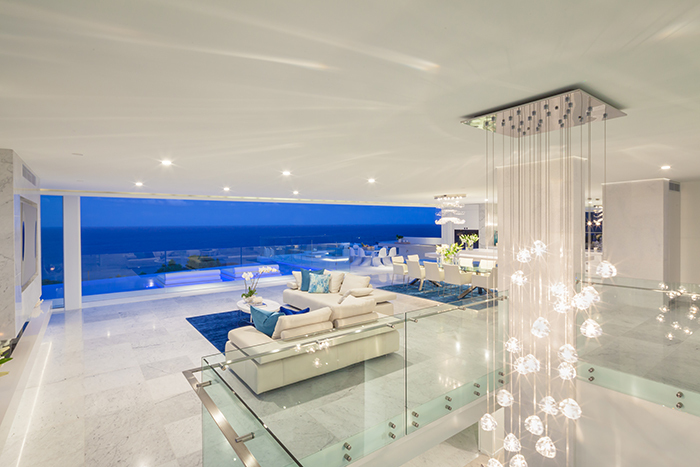 It’s all nothing short of spectacular, in true Chris Clout Design style! Words: Natasha Pavez | Photography: Lucas Muro Photography | Patrick Oberem, Blue Fish Imaging.